"Dive into the world of mixed reality and blur the line between real and digital. 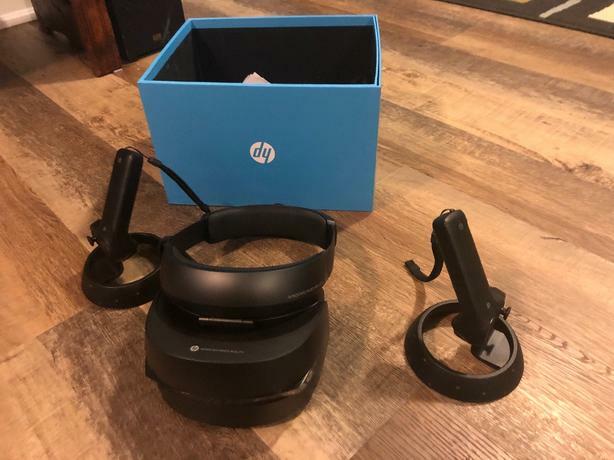 Designed to deliver cutting-edge visual quality and superb comfort, the HP Mixed Reality Headset with Controllers puts the magic of immersive computing within reach." Goes for $500 at Bestbuy, this is lightly used, I still have the original box. Everything works perfectly. Comes with the headset, two controllers, and the HDMI/USB cord to connect. It is plug and play and works with any decent Windows desktop or laptop. You can use it with your Steam library to play VR games, or if you want to get the VorpX plugin you can play the vast majority of games and watch movies in maximum 3D. The only reason I'm selling is because I wish to upgrade the HTC Vive Pro which is literally twice as much money. Serious offers only please, this is my downpayment on my upgrade.